BDI-BioEnergy International AG announced that it has completed commissioning of the largest multifeedstock biodiesel plant in France, Estener's 75,000 ton (22.5 MMgy) plant in Le Havre. BDI stated it completed the project on schedule in 11 months. The companies will work together to collect and analyze data from coprocessing algae and conventional crude oil into fuels. The goal is to complete fuel certifications to ready Sapphire Energy's Green Crude for wide-scale oil refining. The German biodiesel quality association, AGQM, and a leading manufacturer of parking heater systems completed a long-term oxidation stability study of biodiesel from rapeseed oil using different additives and storage conditions. Amyris and Total have formed Total Amyris BioSolutions B.V., a 50/50 joint venture that now holds exclusive rights and a license under Amyris' intellectual property to produce and market renewable diesel and jet fuel from Amyris' renewable farnesene. Methes Energies International has signed a letter of intent to acquire the assets of OTC Energy Technologies, including all of OTC's technologies and know-how relating to conversion of biomass into syngas for reforming into alcohols and hydrocarbons. Greenleaf Biofuels LLC announced in December that, as of Oct. 31, the company produced its 1 millionth gallon of biodiesel. In commercial production at its New Haven, Conn., terminal location since this summer, reaching this milestone was a key goal. Leaders from Renewable Energy Group joined more than two dozen biodiesel advocates in providing testimony at an EPA hearing on the proposed 2014 RFS volumes. REG's Gary Haer questioned why EPA used outdated data to develop its RVO proposal for 2014. Several Iowa business leaders, farmers and the governor have made a compelling case for expanding biodiesel under the federal RFS at an EPA hearing Dec. 5. 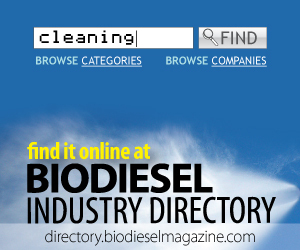 The agency has proposed stalling the biomass-based diesel mandate for both 2014 and 2015.